Trailers are shipped Freight, please contact us for shipping rates﻿! Rhino Trailers feature Dual Molded-In Power Rails for the ultimate in strength and durability. Two Aluminum I-Beam Rails are molded directly into the trailer body during the manufacturing process to serve as the anchor point for the trailer bed. No drilling holes in the polyethylene body and relying on a bolt and washer to secure your load. Rhino frames bolt directly to the Power Rails providing the highest level of strength and performance. Rhino Trailers are purpose-built for consistent, heavy-duty use in all seasons and for a multitude of uses including farm and ranch, landscaping, hunting, fishing or any hauling need. 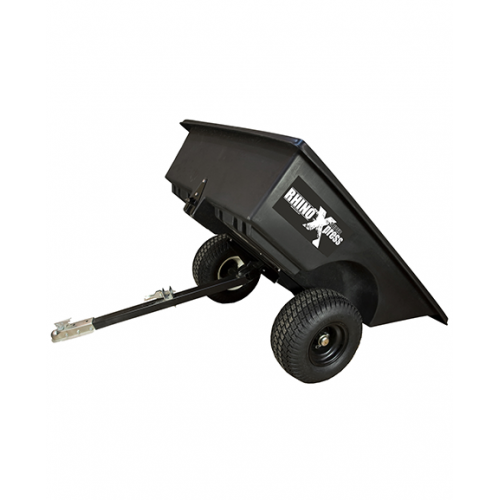 Trailers tow smoothly behind any ATV, garden tractor or small utility vehicle.